You may have seen footage from the recent RCN Congress of the icy and sometimes hostile reception Health Secretary Andrew Lansley received from nurses. If you’re one of the very few people in this country who isn’t either working in the NHS or has a relative who is, then you might not quite have understood what all the fuss was about. I’m married to a nurse, and I see her come home from every shift physically and emotionally shattered. The work is hard, she cares about her patients, and the ward is chronically short-staffed, in spite of constant pleas that the situation is sometimes so bad that patient safety is at risk. Management attention seems to be on cost-savings, and how to adapt to the upheaval and risk caused by Lansley’s forced-through ‘reform’ of the NHS, which is going to force health trusts to allow in a far greater level of participation by private companies, resulting in a fragmented system, deterioration in pay, hours and conditions for staff and will inevitably impact negatively on patient care. This ‘reform’ is universally unpopular with health workers. Doctors, nurses and other professionals say the changes are unnecessary and harmful. So why is Andrew Lansley – fully backed by David Cameron – so determined to do it? He goes on to say that costs are rising at an unaffordable rate and that this means “we need to rethink how the system works”. However, if you look at the situation a little more closely, you’ll find that Lansley’s claims don’t stand up. (If you’ve read my other posts and you think you’re seeing a trend, you’re absolutely right – this government absolutely has a very different, and very dark, hidden agenda that it tries to disguise with its public pronouncements). Lansley’s reforms, in allowing private companies to bid to provide NHS services and even to run whole hospitals, aim to emulate the situation in the USA, where most hospitals are essentially private companies and are run for a profit. The wellbeing of patients is secondary to the profit motive – treating people is just how they make their money. You might think this is a price worth paying if it’s going to save the great British tax-payer money, but will it? Note the wording: ‘This leads to…increased cost and poor performance’. Not might lead, may lead. The report recognises – and without any proposed remedy – that Lansley’s ‘reform’ will lead to increased cost, as well as poor performance. The report recognises that under the new, fragmented system, financial control will be lost. The report recognises that, in the new system, there will be adverse financial implications for staff. Private providers, seeking to maximise profits, will push down wages as far as they can. It’s absolutely clear that private healthcare providers, because they have to make a profit, can only compete with the not-for-profit NHS on costs by reducing staff costs – which means fewer staff, and poorer pay for those that they do employ (and of course almost certainly economies on things like quality of materials, bandages and so on used on patients). So a major private healthcare provider also confirms that private companies are, by definition, going to be more expensive. That’s right. Your eyes are not deceiving you. Even with a system where the sick have to pay for their own care, the US still spends 29% more per person on healthcare than we do! And add back in what people pay privately – as we’ll end up doing as the NHS gets progressively privatised – and it will cost at least twice as much. Case closed, I think. Anything more than a passing glance at the facts shows that there is no way that Andrew Lansley’s reforms have anything to do with efficiency, economy, improvement or even our current economic situation. Those are just excuses, since all the numbers, the private healthcare providers themselves, and the global statistics say that the new system is going to be more expensive than what we have now. Lansley and his Tory pals believe in a small-state Britain where people have to fend for themselves. They believe that if something is government-funded it’s automatically a Bad Thing (with the possible exception of the army – and given their evident readiness to privatise policing, I have doubts even about that!). They’re so committed to this skewed worldview that they believe that even if costs us all more, that’s a price worth paying. After all, they and their backers will save more, and if they get ill they can easily afford it. Inserting a profit-layer into the process inevitably – as the evidence above demonstrates emphatically – makes the system more expensive. 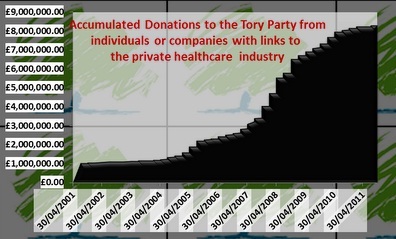 But as this graph demonstrates, private healthcare companies have donated massively to the Tory party, and they want payback. In addition, many Tory politicians have invested in private health providers, and stand to make enormous financial gains from the new system. My money’s on a combination of both, with greed being the common factor in both cases. Where would you put yours? I am a long-term benificiary of the wonderful N.H.S. – to say that I am scared of the future for my children and grandchildren if this ghastly plan is implemented would be an understatement. There has to be a permanently manned protest group outside every hospital and Doctor`s surgery, to persuade apathetic or unaware members of the public to resist this horrible plan, until the goverment itself is overturned. If I were fit, young and healthy, I would be out there now – shouting from the rooftops !! The Tories are relying on the `There`s nothing we can do about it` hordes, Oh – and the Media MUST report protests fairly – if they bother at all.. I am so angry about this issue, I don`t care if people get fed up with me `going on about things` ! They`ll be sorry if the N.H.S. disappears…. It’s starting to look more and more like the ‘cash for dinners with the PM’ that were bought by these companies are having a real impact on policy. And to think Cameron denied that there was anything in it.